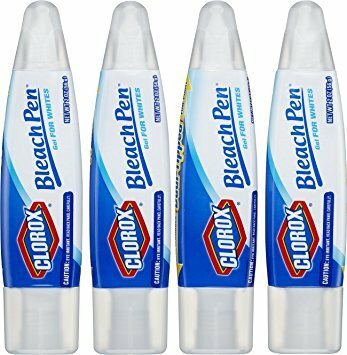 Clorox Bleach Pen in a gel formula has the power of Clorox bleach in a pen to target stains with precision and control. Spot treat even the toughest stains on all of your white laundry needs. The stain remover pen features a no leak dual-tipped applicator with a fine point for precise stain removal and a broad scrubber tip to scrub gel into tough stains for better overall results. The Clorox Bleach Pen works on household surfaces and laundry alike, so you can write off stains for good, wherever they are. Perfect for white laundry stain removal such as coffee, tea, red sauce and wine or caulk and tile grout cleaning in your kitchen and bathroom, Clorox Bleach Pens are convenient and easy to use. Simply unscrew the tip that you would like to use, apply gel and rinse or wipe clean. The multi pack size allows you to keep pens throughout the house or on the go. If you have any questions about this product by Clorox Bleach, contact us by completing and submitting the form below. If you are looking for a specif part number, please include it with your message.